John had the most intimate hands-on contact and acquaintance with Jesus Christ, who is THE LIFE. We must walk in the light and confess sins to have fellowship with God and fellow believers and to have cleansing from all sin. We should engage in a pro-active pursuit of God. We need to be diligent in Bible reading and study, in honest prayer to God, in quality fellowship with sincere believers, and in our witnessing for Jesus Christ to non believers. Jamieson, Fausset, & Brown, Commentary 1871: http://www.ccel.org/ccel/jamieson/jfb.xi.xxiii.ii.html 1Jo 1:1-10. The Writer's Authority as an Eyewitness to the Gospel Facts, Having Seen, Heard, and Handled Him Who Was from the Beginning: His Object in Writing: His Message. If We Would Have Fellowship with Him, We Must Walk in Light, as He Is Light. That which was—not "began to be," but was essentially (Greek, "een," not "egeneto") before He was manifested (1Jo 1:2) ; answering to "Him that is from the beginning" (1Jo 2:13); so John's Gospel, Joh 1:1, "In the beginning was the Word." Pr 8:23, "I was set up from everlasting, from the beginning, or ever the earth was." we—apostles. heard … seen … looked upon … handled—a series rising in gradation. Seeing is a more convincing proof than hearing of; handling, than even seeing. "Have heard … have seen" (perfect tenses), as a possession still abiding with us; but in Greek (not as English Version "have," but simply) "looked upon" (not perfect tense, as of a continuing thing, but aorist, past time) while Christ the incarnate Word was still with us. "Seen," namely, His glory, as revealed in the Transfiguration and in His miracles; and His passion and death in a real body of flesh and blood. "Looked upon" as a wondrous spectacle steadfastly, deeply, contemplatively; so the Greek. Appropriate to John's contemplative character. hands … handled—Thomas and the other disciples on distinct occasions after the resurrection. John himself had leaned on Jesus' breast at the last supper. Contrast the wisest of the heathen feeling after (the same Greek as here; groping after WITH THE HANDS") if haply they might find God (see Ac 17:27). This proves against Socinians he is here speaking of the personal incarnate Word, not of Christ's teaching from the beginning of His official life. of—"concerning"; following "heard." "Heard" is the verb most applying to the purpose of the Epistle, namely the truth which John had heard concerning the Word of life, that is, (Christ) the Word who is the life. "Heard," namely, from Christ Himself, including all Christ's teachings about Himself. Therefore he puts "of," or "concerning," before "the word of life," which is inapplicable to any of the verbs except "heard"; also "heard" is the only one of the verbs which he resumes at 1Jo 1:5. 2. the life—Jesus, "the Word of life." was manifested—who had previously been "with the Father." show—Translate as in 1Jo 1:3, "declare" (compare 1Jo 1:5). Declare is the general term; write is the particular (1Jo 1:4). that eternal life—Greek, "the life which is eternal." As the Epistle begins, so it ends with "eternal life," which we shall ever enjoy with, and in, Him who is "the life eternal." which—Greek, "the which." the before-mentioned (1Jo 1:1) life which was with the Father "from the beginning" (compare Joh 1:1). This proves the distinctness of the First and Second Persons in the one Godhead. 3. That which we have seen and heard—resumed from 1Jo 1:1, wherein the sentence, being interrupted by 1Jo 1:2, parenthesis, was left incomplete. declare we unto you—Oldest manuscripts add also; unto you also who have not seen or heard Him. that ye also may have fellowship with us—that ye also who have not seen, may have the fellowship with us which we who have seen enjoy; what that fellowship consists in he proceeds to state, "Our fellowship is with the Father and with His Son." Faith realizes what we have not seen as spiritually visible; not till by faith we too have seen, do we know all the excellency of the true Solomon. He Himself is ours; He in us and we in Him. We are "partakers of the divine nature." We know God only by having fellowship with Him; He may thus be known, but not comprehended. The repetition of "with" before the "Son," distinguishes the persons, while the fellowship or communion with both Father and Son, implies their unity. It is not added "and with the Holy Ghost"; for it is by the Holy Ghost or Spirit of the Father and Son in us, that we are enabled to have fellowship with the Father and Son (compare 1Jo 3:24). Believers enjoy the fellowship OF, but not WITH, the Holy Ghost. "Through Christ God closes up the chasm that separated Him from the human race, and imparts Himself to them in the communion of the divine life" [Neander]. 4. these things—and none other, namely, this whole Epistle. write we unto you—Some oldest manuscripts omit "unto you," and emphasize "we." Thus the antithesis is between "we" (apostles and eye-witnesses) and "your." We write thus that your joy may be full. Other oldest manuscripts and versions read "OUR joy," namely, that our joy may be filled full by bringing you also into fellowship with the Father and Son. (Compare Joh 4:36, end; Php 2:2, "Fulfil ye my joy," Php 2:16; 4:1; 2Jo 8). It is possible that "your" may be a correction of transcribers to make this verse harmonize with Joh 15:11; 16:24; however, as John often repeats favorite phrases, he may do so here, so "your" may be from himself. So 2Jo 12, "your" in oldest manuscripts. The authority of manuscripts and versions on both sides here is almost evenly balanced. Christ Himself is the source, object, and center of His people's joy (compare 1Jo 1:3, end); it is in fellowship with Him that we have joy, the fruit of faith. 5. First division of the body of the Epistle (compare Introduction). declare—Greek, "announce"; report in turn; a different Greek word from 1Jo 1:3. As the Son announced the message heard from the Father as His apostle, so the Son's apostles announce what they have heard from the Son. John nowhere uses the term "Gospel"; but the witness or testimony, the word, the truth, and here the message. 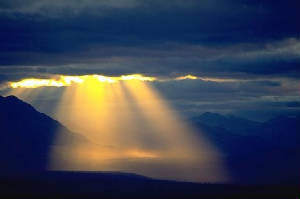 God is light—What light is in the natural world, that God, the source of even material light, is in the spiritual, the fountain of wisdom, purity, beauty, joy, and glory. As all material life and growth depends on light, so all spiritual life and growth depends on God. As God here, so Christ, in 1Jo 2:8, is called "the true light." no darkness at all—strong negation; Greek, "No, not even one speck of darkness"; no ignorance, error, untruthfulness, sin, or death. John heard this from Christ, not only in express words, but in His acted words, namely, His is whole manifestation in the flesh as "the brightness of the Father's glory." Christ Himself was the embodiment of "the message," representing fully in all His sayings, doings, and sufferings, Him who is LIGHT. 6. say—profess. have fellowship with him—(1Jo 1:3). The essence of the Christian life. walk—in inward and outward action, whithersoever we turn ourselves[Bengel]. in darkness—Greek, "in the darkness"; opposed to "the light" (compare 1Jo 2:8, 11). lie—(1Jo 2:4). do not—in practice, whatever we say.the truth--(Eph 4:21; Joh3:21). 7. Compare Eph 5:8, 11-14. "We walk"; "God is (essentially in His very nature as 'the light,' 1Jo 1:5) in the light." Walking in the light, the element in which God Himself is, constitutes the test of fellowship with Him. Christ, like us, walked in the light (1Jo 2:6). Alford notices, Walking in the light as He is in the light, is no mere imitation of God, but an identity in the essential element of our daily walk with the essential element of God's eternal being. we have fellowship one with another—and of course with God (to be understood from 1Jo 1:6). Without having fellowship with God there can be no true and Christian fellowship one with another (compare 1Jo 1:3). and—as the result of "walking in the light, as He is in the light." the blood of Jesus … cleanseth us from all sin—daily contracted through the sinful weakness of the flesh, and the power of Satan and the world. He is speaking not of justification through His blood once for all, but of the present sanctification("cleanseth" is present tense) which the believer, walking in the light and having fellowship with God and the saints, enjoys as His privilege. Compare Joh 13:10, Greek,"He that has been bathed,needeth not save to wash his feet, but is clean every whit." Compare 1Jo 1:9, "cleanse us from all unrighteousness," a further step besides "forgiving us our sins." Christ's blood is the cleansing mean, whereby gradually, being already justified and in fellowship with God, we become clean from all sin which would mar our fellowship with God. Faith applies the cleansing, purifying blood. Some oldest manuscripts omit "Christ"; others retain it. onfession of sins is a necessary consequence of "walking in the light" (1Jo 1:7). "If thou shalt confess thyself a sinner, the truth is in thee; for the truth is itself light. Not yet has thy life become perfectly light, as sins are still in thee, but yet thou hast already begun to be illuminated, because there is in thee confession of sins" [Augustine]. that we have no sin—"Have," not "have had," must refer not to the past sinful life while unconverted, but to the present state wherein believers have sin even still. Observe, "sin" is in the singular; "(confess our) sins" (1Jo 1:9) in the plural. Sin refers to the corruption of the old man still present in us, and the stain created by the actual sins flowing from that old nature in us. To confess our need of cleansing from present sin is essential to "walking in the light"; so far is the presence of some sin incompatible with our in the main "walking in light." But the believer hates, confesses, and longs to be delivered from all sin, which is darkness. "They who defend their sins, will see in the great day whether their sins can defend them." deceive ourselves—We cannot deceive God; we only make ourselves to err from the right path. the truth—(1Jo 2:4). True faith. "The truth respecting God's holiness and our sinfulness, which is the very first spark of light in us, has no place in us" [Alford]. 9. confess—with the lips, speaking from a contrite heart; involving also confession to our fellow men of offenses committed against them. he—God. faithful—to His own promises; "true" to His word. just—Not merely the mercy, but the justice or righteousness of God is set forth in the redemption of the penitent believer in Christ. God's promises of mercy, to which He is faithful, are in accordance with His justice. to—Greek, "in order that." His forgiving us our sins and cleansing us, &c., is in furtherance of the ends of His eternal faithfulness and justice. forgive—remitting the guilt. cleanse—purify from all filthiness, so that henceforth we more and more become free from the presence of sin through the Spirit of sanctification (compare Heb 9:14; and above, see on 1Jo 1:7). unrighteousness—offensive to Him who "is just" or righteous; called "sin," 1Jo 1:7, because "sin is the transgression of the law," and the law is the expression of God's righteousness, so that sin is unrighteousness. "His word," which is "the truth" (1Jo 1:8), accuses us truly; by denying it we drive it from our hearts (compare Joh 5:38). Our rejection of "His word" in respect to our being sinners, implies as the consequence our rejection of His word and will revealed in the law and Gospel as a whole; for these throughout rest on the fact that we have sinned, and have sin. Jesus saith unto him, I am the way, the truth, and the life: no man cometh unto the Father, but by me (John14:6).